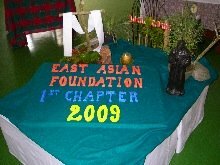 This year the East Asian Mission Vicariate celebrated the feast of the Immaculate Conception in a special way and for several reasons. All the members, professed and students, gathered at the Father Jordan Formation House in Amadeo to observe the 131st anniversary of the founding of the Society of the Divine Savior. Many friends and benefactors joined us, beginning the day with a special music and art program. Fr. Gunther Mayer, SDS, honored the 100th birthday of Fr. Ivo Schaible, noted Salvatorian artist. Much of his work, both on canvas and stained glass is located in the Colombian (SA) Province where he lived and worked for many years. Three large samples of his creativity hung behind the altar on the chapel wall. Interspersed with Fr. Gunther's presentations of Fr. Ivo's life and work, were classical guitar pieces played by professinal guitarist, Mr. Solaiman Jamisolamin, of Manila, whose selections were mainly from the Spanish school, such as Albeniz and Tarrega. After an intermission, all returned to the Chapel for the Eucharistic Liturgy during which Fr. Christopher Kowalczk, SDS, because of his recent election to the Salvatorian Generalate in Rome, formally passed the mantle of Vicariate Superior to Fr. Adam Janus, SDS. Also named were Fr. 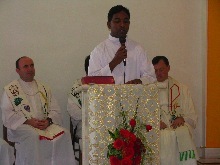 Artur Chrzanowski, SDS, vicar, and Frs. 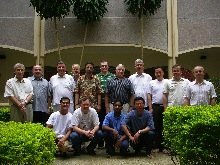 Wilson Catabay, SDS andHubert Kranz, SDS, consultors. Because the day was the 10th anniversary of the Formation House, during his homily, Fr. Hubert described those first ten years. 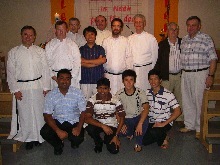 Following the Mass, all made their way to the dining room where a meal of banquet proportions awaited them. The afternoon was filled with presentations from the Father Jordan Youth and Father Jordan Children, along with soccer and basketball contests among members from the theologate, philosophate, novitiate, and language school. Passing on the offer to sleep on the front lawn, all guests were able to return to their residences well before midnight.